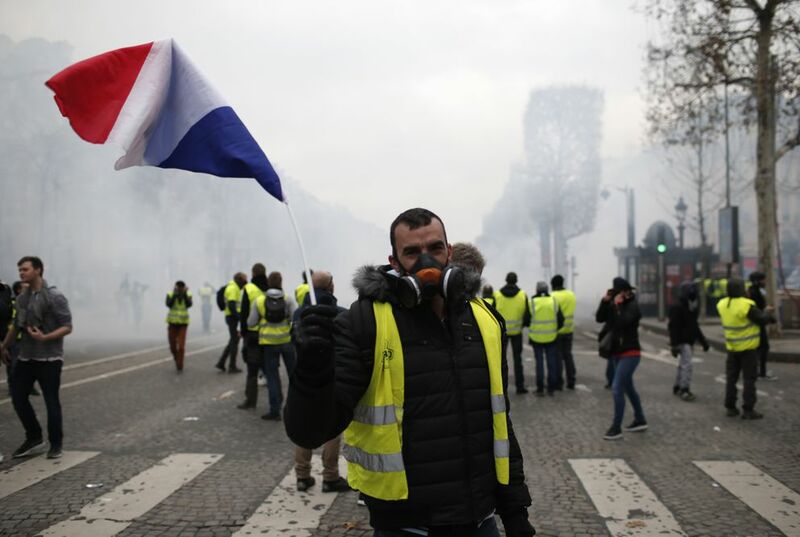 PARIS — The rumble of armored police trucks and the hiss of tear gas filled central Paris on Saturday, as French riot police fought to contain thousands of yellow-vested protesters venting their anger against the government in a movement that has grown more violent by the week. 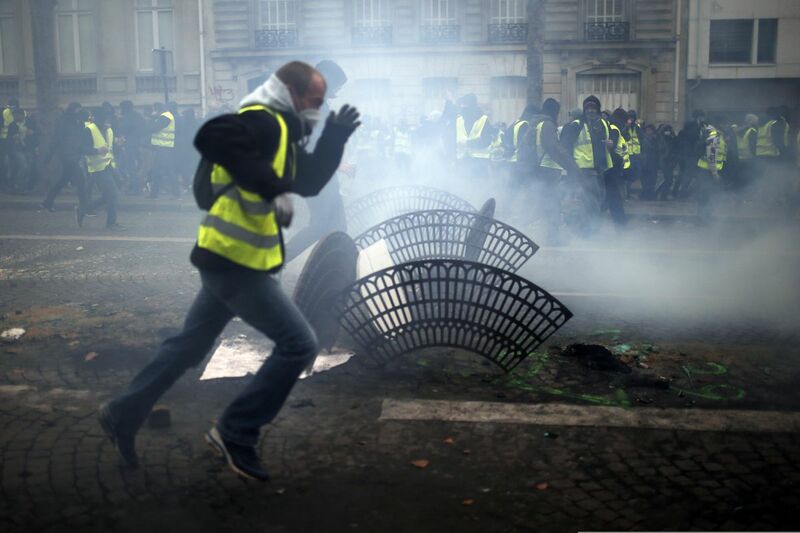 A ring of steel surrounded the president's Elysee Palace — a key destination for the protesters — as police stationed trucks and reinforced metal barriers throughout the neighborhood. 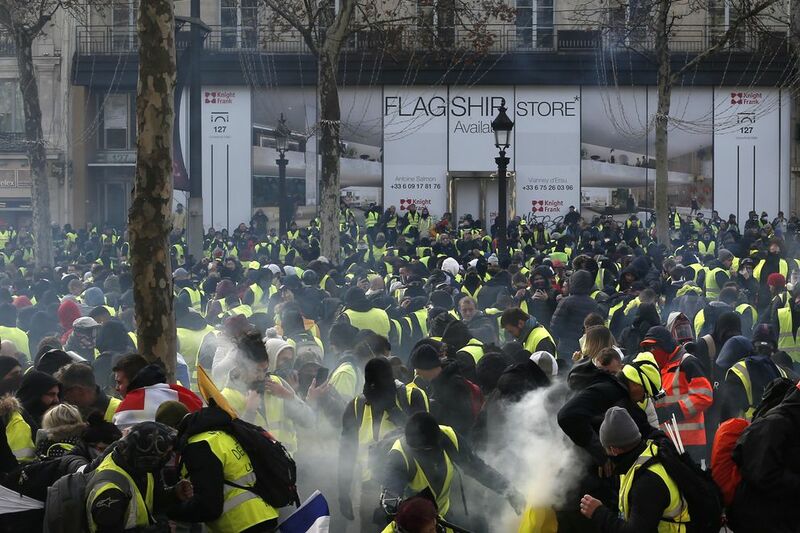 Saturday's yellow vest crowd was overwhelmingly male, a mix of those bringing their financial grievances to Paris — the center of France's government, economy and culture — along with groups of apparently experienced vandals, who tore steadily through some of the city's wealthiest neighborhoods, smashing and burning. 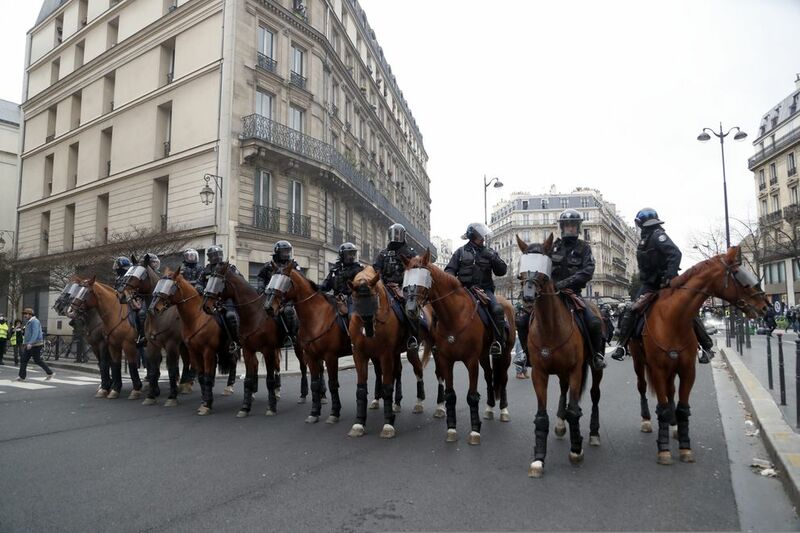 Police and protesters also clashed in the southern French cities of Marseille and Toulouse. 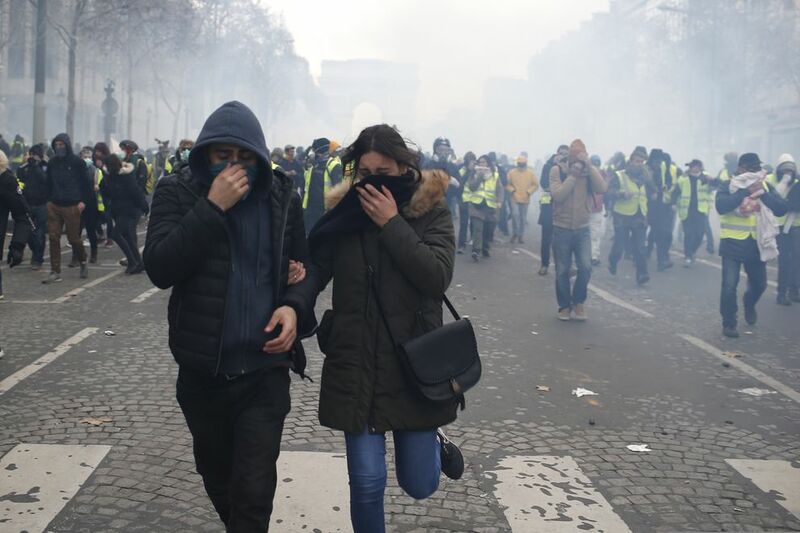 The government's plan was to prevent a repeat of the Dec. 2 rioting that damaged the Arc de Triomphe, injured 130 people and tarnished the country's global image. 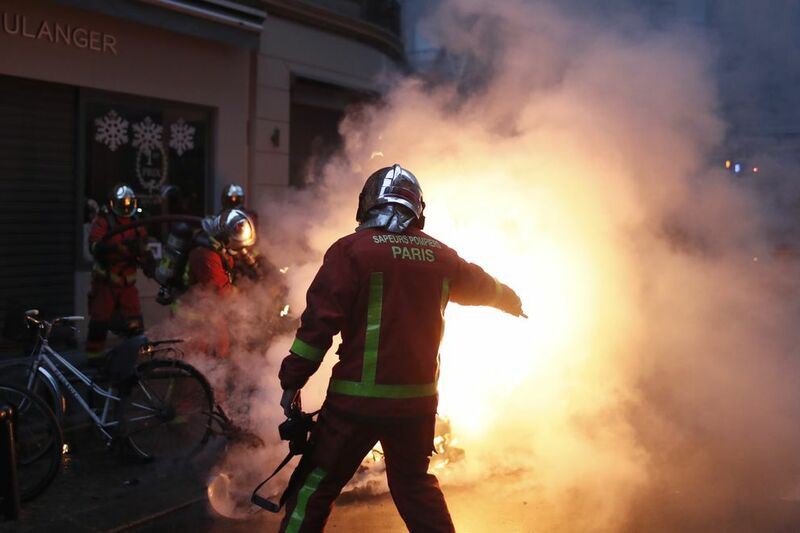 But although Saturday's protest in the French capital started out quietly, by late afternoon at least 551 people had been taken into custody and 60 people had been injured, according to Paris police and hospitals. Some stores along the city's elegant Champs-Elysees Avenue had boarded up their windows as though bracing for a hurricane, but the storm struck anyway, this time at the height of the holiday shopping season. Protesters ripped off the plywood protecting the windows and threw flares and other projectiles as they were repeatedly repelled by tear gas and water cannon. All of the city’s top tourist attractions — including the Eiffel Tower and the Louvre museum — shut down for the day, fearing the kind of damage that had hit the Arc de Triomphe. Subway stations in the city center also closed and the U.S. embassy warned its citizens to avoid all protest areas. Yet in a sign of the financial disconnect that infuriates many of the protesters, within a block of the famed boulevard, people were sitting in Paris cafes, drinking cocktails and chatting. Amid the melee, President Emmanuel Macron remained invisible and silent, as he has for the four weeks of a movement that started as a protest against a gas tax hike and metamorphosed into a rebellion against high taxes, eroding living standards and what many see as his inability to address the concerns of France's regions and ordinary people. Before the clashes, Interior Minister Christophe Castaner had urged calm. "I ask the yellow vests that want to bring about a peaceful message to not go with the hooligans. We know that the hooligans are only strong because they hide behind the yellow vests, which hampers the security forces," he said. Even as blue armored trucks rumbled over cobblestone streets and police moved yet again against protesters on the Champs-Elysees, an even larger environmental march moved peacefully Saturday toward the city's distant Republique Plaza. A scattering of yellow vests, as well as women, children and retirees, were among the 17,000 participants marching to demand action against climate change. One sign read "No climate justice without fiscal and social justice." The march came in support of U.N. climate talks taking place in Poland. France's yellow vest protesters include people with views that range from the far right to the far left. The leaderless group is united primarily in its sense that Macron and his government are out of touch. "We are here to tell (Macron) our discontent. Me, I'm not here to break things because I have four children so I am going to try to be safe for them, because they are afraid," said protester Myriam Diaz. "But I still want to be here to say 'Stop, that's enough, this has to stop.'" Cyril, a 25-year-old garbage truck driver, came from Normandy with three other demonstrators to Paris. He said he earns 1,430 euros ($1,625) a month despite working 45 hours a week and has decided not to have children because doesn't feel he can earn enough to raise them. This was his third weekend of protesting in Paris. "I've come to defend myself," he said, adding that Macron's mistake was trying to reform the French economy too quickly. "He's done more in 18 months than the others in 30 years." Macron on Wednesday agreed to abandon the fuel tax hike, which aimed to wean France off fossil fuels and uphold the Paris climate agreement. Many economists and scientists say higher fuel taxes are essential to saving the planet from worsening climate change, but that approach hasn't defused the popular anger. 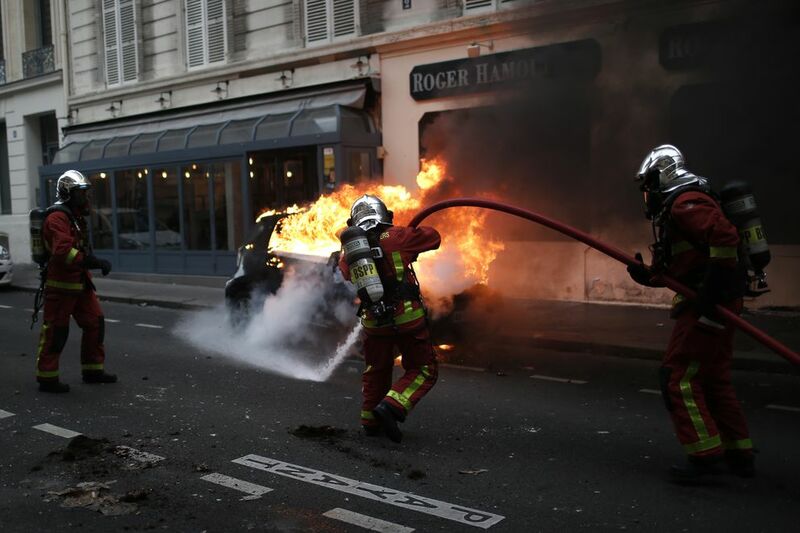 The renewed violence in Paris gave the impression of a government that is powerless against the uprising. Protesters who came to Paris from Normandy described seeing officers block yellow-vested passengers from boarding public transportation at stops along their route. The national gendarme service posted a video on Twitter of police tackling a protester and confiscating his dangerous material, which appeared to be primarily a tennis racket. Four people have died in accidents since the unrest began Nov. 17 and Christmas markets, national soccer matches and countless cultural events have been canceled due to the protests. Protesters also blocked roads, roundabouts and tollbooths elsewhere in France and offshoot movements have emerged in Belgium and the Netherlands. Belgian police fired tear gas and water cannon Saturday at yellow-vested protesters calling for the resignation of Prime Minister Charles Michel after they tried to breach a riot barricade. The protesters in Brussels threw paving stones, road signs, fireworks, flares and other objects at police and about 100 were detained, many for carrying dangerous objects. According the ocean, U.S. President Donald Trump seized the moment to criticize the 2015 Paris climate accord, which he is pulling the United States out of, in a series of tweets Saturday. “People do not want to pay large sums of money ... in order to maybe protect the environment,” he tweeted.